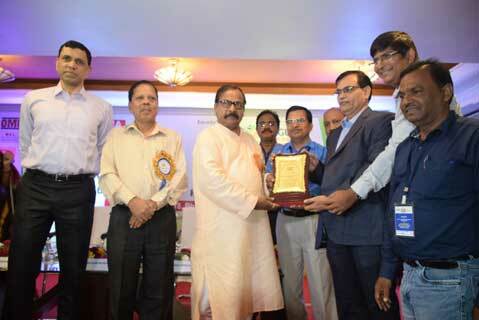 Bhubaneswar: GMR Kamalanga Energy Limited (GKEL) won the CSR Award for Sustainable Livelihood Initiatives instituted by Odisha CSR Forum at a grand seminar organised at Bhubaneswar on Saturday. The Award was given away by State Finance Minister, Shri. Sashibhusan Behera to GKEL. The Award was received by Shri. Arabinda Pani, Head (O&M), Shri. Dillip Kumar Kar, Head (GMRVF) and Shri. Srijit Mishra, Head (HR) of GKEL. This Award is a recognition of the outstanding work in CSR, especially in Sustainable Livelihood Initiatives carried out by GKEL through the GMR Group’s CSR wing, GMR Varalakshmi Foundation (GMRVF). The Foundation has been carrying out intensive CSR Work in Education, Health & Hygiene, Livelihood & Empowerment right from the inception of GKEL at Kamalanga and Mangalpur Panchayats in Dhenkanal District. A day-long discussion was organized on Corporate Social Responsibility (CSR) among the corporate leaders and CSR professionals. Among others, Dr. S Pasupalak, Vice-Chancellor, OUAT, Dr. Sudhansu Sarangi and Additional DG (Police) and Mrs. Anjana Panda, Joint Secretary (Govt. of Odisha) were present on the occasion. The award acknowledges GKEL’s transformational Livelihood Restoration Program (LRP) interventions that have impacted the quality of life of people in Kamalanga and Mangalpur Panchayat over the last three years. GKEL has implemented a special livelihood program for the project affected families to enhance the economic standard of the people in the periphery area.